The holidays are quickly approaching, and Vagabond Kitchen and Bar will be open for both Christmas Eve and Christmas Day. Chef Roberto Dubois has cooked up a delicious four-course dinner menu for Christmas Eve. Guests can enjoy this meal for $69 per adult and $35 per child under 12. 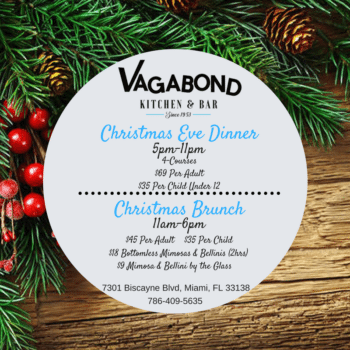 Following this Christmas Eve dinner is Vagabond’s Christmas Brunch at $45 per adult and $15 per child. Guests can sip on bottomless mimosas and bellinis for $18 for two hours or by the glass for $9. For those that don’t want to cook for Christmas Eve this year, Pinch will be offering a Holiday Feast-To-Go. There are two options for the Holiday Feast-To-Go – a stuffed crown roast of lamb ($370.00) or a whole turkey ($250.00). Each option serves six people and includes the following sides: truffled pommes puree, Pinch holiday salad, homemade buttermilk biscuits, sautéed garlicky broccoli rabe, and fire roasted bell peppers. The last day to place orders for the Holiday Feast-To-Go is December 21st. Orders will be available pick up December 24th up until 4:30 p.m. In addition, Pinch will be open for brunch on Saturday, December 24th from 10:30 a.m. to 4:30 p.m as well as on Sunday, December 25th from 10:30 a.m. to 4:30 p.m.
For a limited time only, Pubbelly will serving their yearly cochinillo packages. Each package is $250 and features a 10-pound pig with 4 sides, mamposteao, mofongo, tostones plus more to choose from. Orders must be placed 24 hours in advance for take out or eat in. Call Pubbelly at 305-532-7555 or email info@pubbelly.com to order yours. 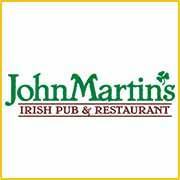 This Christmas Eve, John Martin’s Restaurant and Irish Pub invites friends and families to an evening of Christmas festivities. Enjoy a holiday meal stamped with Santa’s approval and relax knowing his elves are in charge of this year’s menu. Join Coral Gables best Irish Pub on Saturday, December 24th from 5 to 9:30 p.m. and enjoy a three-course prix fixe menu. The three-course menu starts with your choice of a cream of mushroom soup or field greens salad. Entrée selections include a roast turkey and ham with a savory stuffing and mashed potatoes, a roast pork loin served with black beans, rice and yuca, or a grilled salmon filet topped with herb butter . To end the evening on a sweet note, a range of decadent desserts will be offered. Interested guests can call the restaurant or visit the website for more details on the set menu. The three-course prix fixe menu is $32.95 per adult and $15.50 per child under 13. 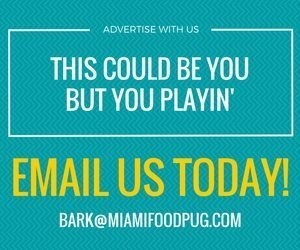 Reservations are suggested and can be made by calling 305-445-3777. 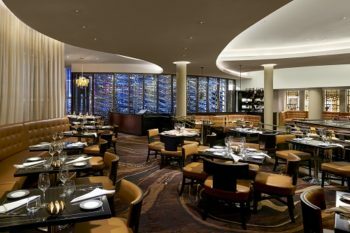 Celebrate Christmas Eve with friends and family at db Bistro Moderne Miami. Executive Chef Clark Bowen offers a four course pre-fixe menu featuring seasonal inspirations such as Lobster Soup, Diver Sea Scallops, Duck Breast, Pork Loin and Pompano. On the sweets side, Pastry Chef Saeko Nemoto will be offering up variations of the Classic Bûche de Noël in addition to other delicious holiday treats. Share and taste options including charcuterie, cheese and a raw bar are available as add-ons to the pre-fixe menu. On Christmas Eve, the lounge will open at 5:30pm, and dinner service starts at 6:00pm with the last seating at 10:00pm. Il Mulino New York at Acqualina Resort & Spa will host a Christmas-inspired Sunday brunch on December 25th from noon to 4 pm for $65/person featuring its traditional pasta, seafood and omelet stations, a special honey baked ham station, holiday decorated desserts, traditional brunch cocktails, live Christmas music and a visit from Santa. The National Hotel‘s prix fixe Holiday Temptation menu includes three delectable courses and two specialty cocktails for $65/person. Standout dishes include Lobster Bisque, Beef Carpaccio, Lamb Chops, 14 oz. Angus Prime Rib and a Pecan Tart. Dinner will be accompanied by live musical performances from Live! 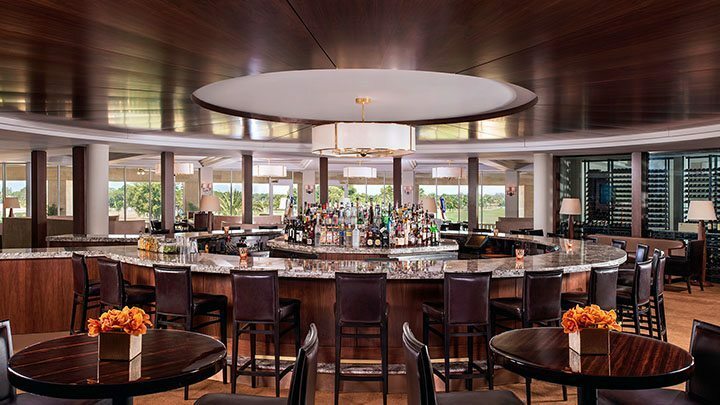 at the National, the hotel’s unique talent of South Florida singers and piano players at their iconic Blues Bar, while sipping refreshing handcrafted cocktails. This Christmas Eve or Christmas, come to Steak 954 for a special holiday meal with your loved ones for breakfast, brunch or dinner. With stunning ocean views, guests can enjoy Mimosas and Bloody Marys along with savory brunch dishes from Chef Jonathan Capo such as the , the Short Rib Benedict on potato pancake, Cuban Style Egg Sandwich with a fried egg, pulled pork and Swiss cheese and the sweet Vanilla French Toast with dulce de leche. Additionally, those looking for dinner plans can choose a variety of delicious options from their extensive steak menu, including a special 8 oz. grass-fed filet mignon or signature dishes such as the Miso Black Cod, Halibut and Roasted Chicken. Holiday specials include a beautiful 16oz Bone In Veal Chop and a 16oz Wagyu Ribeye. Be sure to save room for desserts by Pastry Chef Sarah Magoon. For reservations or more information, please call 954.414.8333. Kitchen 305 at Newport Beachside Hotel & Resort will serve a savory Noche Buena buffet of cold and hot dishes, a meat carving station and desserts from 5 to 10 pm on Christmas Eve. 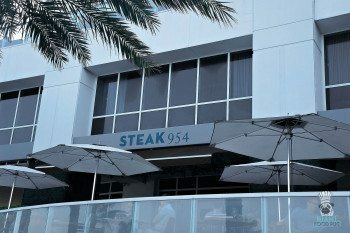 Priced at $45/adult and $25/child, dinner’s stand out dishes include Roasted Suckling Pig, Roasted Portuguese Turkey, Herb Encrusted Prime Rib and Valencia Seafood Paella. From 1 to 9 pm on Christmas Day, Kitchen 305 will offer an unlimited Chinese Buffet for $35/adult and $12/child. Menu highlights include Snow Crab legs, assorted sushi, Mongolian Beef, Moo Shu Pork and Upside Down Pineapple Cake. Miami Dade County’s only pier restaurant will offer a chef’s featured special of 12 oz. prime rib with grilled vegetables and a side of roasted potatoes or rice on Christmas. Beach Bar @ Newport Pier will be open from 11 am to midnight on Christmas Day. Shooters Waterfront will offer complimentary pictures with Santa every Saturday in December from 11:30 am to 2:30 pm. 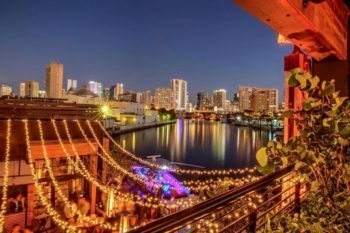 The Fort Lauderdale staple will serve an all-you-can-eat Christmas Eve brunch alongside its al a carte menu and featured chef specials from 10 am to 4 pm. Shooters’ Christmas Eve dinner will include al a carte menu options from 4 pm to 10 pm. The restaurant will be closed on Christmas Day. 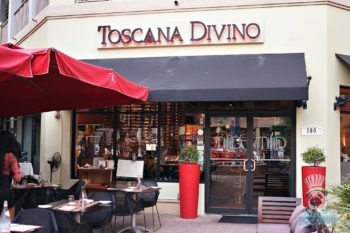 Celebrate Christmas Day at Toscana Divino with a four-course tasting menu prepared by Chef Andrea Marchesin for $65/person. 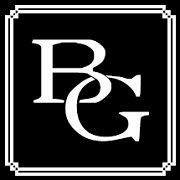 Menu highlights include duck prosciutto served with watercress and goat cheese, tortelli in a parmesan cream and truffle sauce, filet mignon served with herb-crusted potatoes in a wild mushroom sauce and Semifreddo with chocolate sauce. Via Emilia 9 will be offering five course tasting menus for both Christmas Eve and Christmas Day. Priced at $65 per person, menu highlights include handmade tortellini in turkey broth, rabbit leg with Lambrusco reduction, and artisanal panettone with warm Lambrusco zabaione. Alternatively, diners are able to bring a piece of Via Emilia 9 home with them with the launch of Chef Wendy’s private chef and catering services. Perfect for everything from large gatherings or a simple family meal, Chef Wendy’s mouthwatering cooking will be the highlight of any celebration. Call 786-216-7150 for more information. 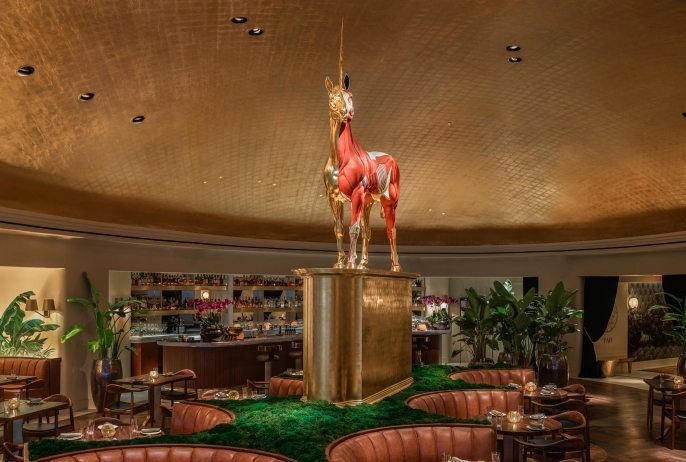 Fontainebleau’s modern American steakhouse is offering a three-course, holiday-inspired prix-fixe menu priced at $75 per person, excluding tax and gratuity, available from 6 p.m. – 11 p.m. on Christmas Eve and Christmas Day. Guests will enjoy a first course of roasted baby beets with Acacia honey vinaigrette, candied hazelnuts, blue cheese, balsamic and watercress; followed by the main course, wood grilled filet mignon with Malabar peppercorn, fingerling potato confit and parsley mustard purée. For dessert, diners will enjoy warm apple crumble with eggnog ice cream. Those seeking a rustic yet elegant holiday meal with a nod to the Feast of the Seven Fishes can indulge in Scarpetta’s four-course prix-fixe menu available on Christmas Eve and Christmas Day from 6 p.m. – 11 p.m. Priced at $75 per person, excluding tax and gratuity, guests will enjoy cioppino with mussels, clams, prawns, and shellfish brodo followed by tagliatelle with lobster, crab, concentrated tomato and pickled ramps; seared snapper with spiced fennel purée, fregola nero and salsa verde; and for dessert, salted caramel budino with rum chantilly and gingerbread. This Christmas, celebrate with fun, fresh Asian cuisine at Talde. Featuring select favorite menu items including Hot & Sour Soup, Eggrolls, Fried Rice, Kung Pao Beef, Peking Duck, and more, the Christmas meal requires a 2-person minimum at $49 per person. Wynwood hotspot Beaker & Gray is switching things up this Christmas with Executive Chef Brian Nasajon’s holiday go to’s – Jewish and Chinese cuisine. 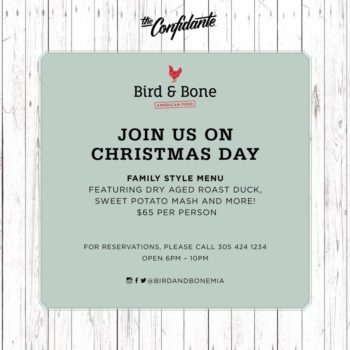 On Christmas Day, guests will be treated to alternative holiday a la carte offerings including General Tso’s Chicken with pineapple and sweet n’ sour sauce; Potato Latkes with charred scallion and horseradish cream; Lo Mein with juicy pork rib and stir fry; and Shakshuka with feta cheese and sour dough bread. Beaker & Gray is located at 2637 North Miami Avenue in Wynwood. Telephone: (305) 699-2637. 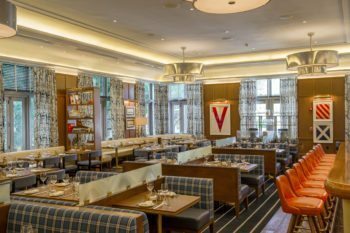 BLT Prime Miami is offering guests a three-course prix fixe Christmas Blackboard Menu ($65), as well as a la carte options. Diners will begin with a choice of Butternut Squash Bisque with candied orange zest and roasted pumpkin gastrique ($14) or Pan Seared Sea Scallops with apple chips, macerated apple and apple cider rouille ($15). Main course includes a choice of Prosciutto Wrapped Monkfish with vegetable bayaldi and truffle vinaigrette ($36) or Prime Bone-in Tenderloin with bone marrow croquettes and smoked sea salt ($42). To accompany the main course, sides include Sweet Potato Pomme Anna with amoretti biscuits and marshmallow ($12) or Roasted Root Vegetables with brown butter and sage ($12). For that sweet finish, a choice of Buche De Noel with eggnog ice cream, whiskey buttercream and pistachio ($10) or Caramel Pecan Tart with brown butter ice cream and bourbon sauce ($10). Reservations for dinner can be made at 305-591-6066 or lukas@bltprime.com. 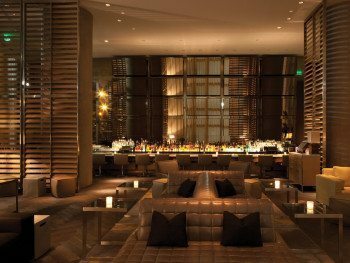 The Dutch, inside the W South Beach, is inviting guests to celebrate the holidays in style with Christmas and New Year’s dinners. 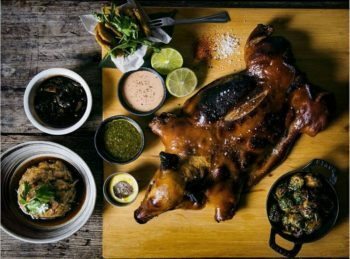 On Christmas Eve, the $50 per person (excluding tax and gratuity) dinner will include a traditional Caja China Pig Roast, along with other savory Latin dishes prepared by Executive Chef Adonay Tafur. Guests can spend the evening in the Grove, the Dutch’s lush outdoor playground, enjoying board games, sipping Coquitos ($8); all while enjoying live music by DJ Bre. The Dutch is located inside W South Beach, 2201 Collins Avenue, in Miami Beach, Florida, 33139. 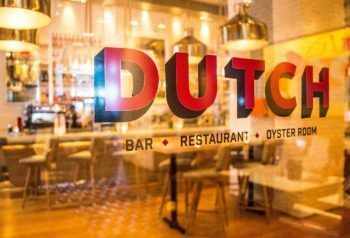 For more information or reservations, please call (305) 938-3111 or email info@thedutchmiami.com. 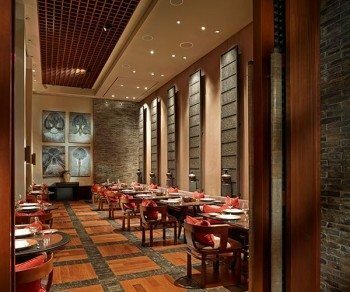 On Christmas Day, Jaya at The Setai will be serving their signature Christmas themed buffet with two seatings at11:30 a.m. and 1:30 p.m. Priced at $125 per person and $63 per child, festivities will include live jazz featuring Christmas carols and a special appearance from Santa Claus. The buffet will offer traditional Christmas food as well as an extensive array of seafood displayed on an impressive ice sculpture. Other favorites include Truffle Roasted Murray Farm Chicken, BBQ Kurobuta Berkshire Pork Ribs and of course some of the Chinese Dim Sum menu items that Jaya is famous for. Guests can also find a variety of Asian fusion dishes available such as Indonesian Beef Rendang and Traditional Pad Thai. 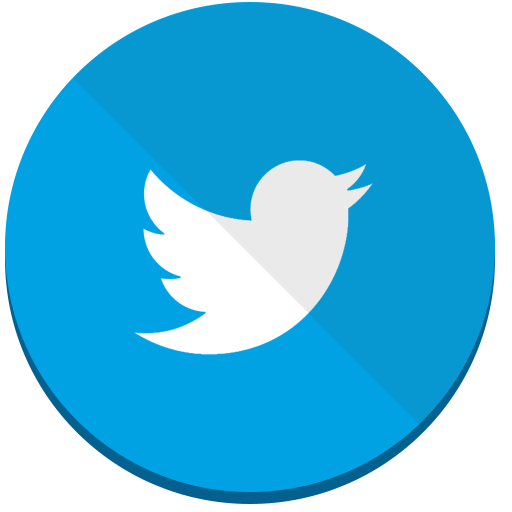 The holidays – as lovely as they are – can be a very stressful time of year. With the pressure of gift shopping/wrapping and family coming into town, the last thing you should worry about is putting together a holiday meal to satisfy everyone at the table. 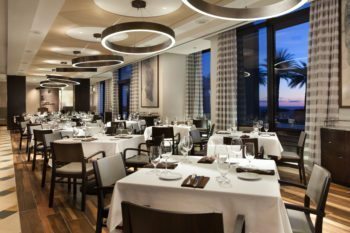 Luckily, the Pullman Miami is (literally) taking one thing off your plate this December by offering an exclusive three-course “Holiday Spice” menu for only $25 per person at La Riviera restaurant. The meal (available for both lunch and dinner) also comes with the hotel’s signature holiday sangria and complimentary 2-hour parking. Available from December 12 – 31, this decadent prix-fix holiday menu features traditional festive favorites and a few seasonal twists with regional flair including butternut squash soup with browned sage butter and braised turkey breast with mushroom bread pudding. For dessert, guests can opt for the warm cinnamon apple crumble with salted caramel ice cream or milk chocolate mousse with the classic Crème de Vie. 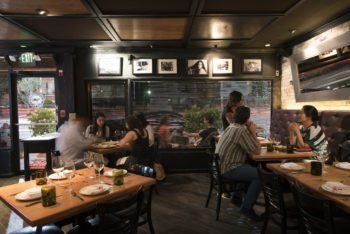 Beloved Miami Beach eatery, Macchialina, will be offering a special four-course Chef’s Tasting Menu for the holidays in addition to its classic dinner menu of rustic Italian favorites. On Christmas Eve and New Year’s Eve, the feast will feature a variety of dishes in each course – served family style – for $55 per person, with an additional wine pairing for $28 per person. The restaurant will also be offering specials such as a succulent Veal Osso Bucco and Whole Roasted Fish with white wine and cherry tomatoes; available a la carte or as part of the tasting menu. Macchialina is located at 820 Alton Road on Miami Beach. The restaurant will be closed Christmas Day. 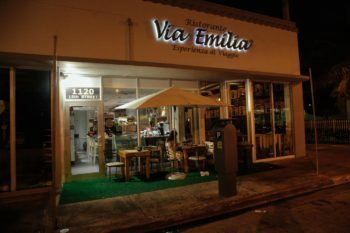 Reservations are strongly suggested and can be made by calling the restaurant at (305) 534-2124. 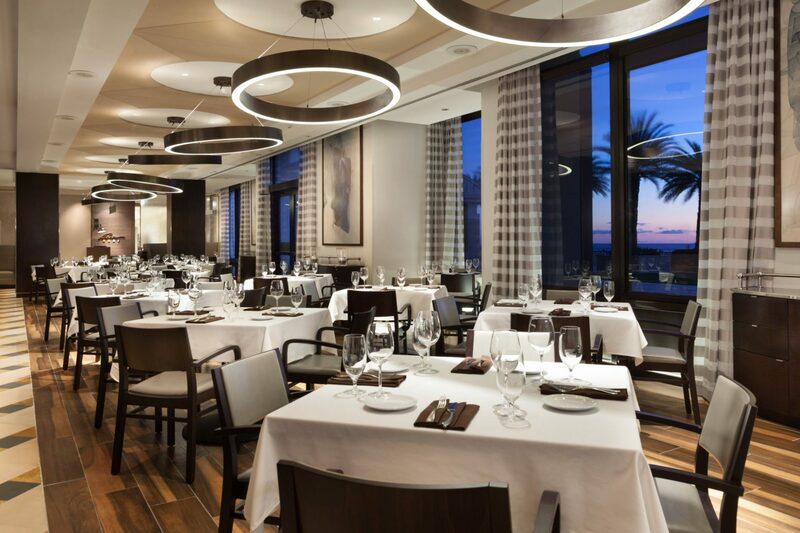 Miami Beach’s seafood hotspot, Lure Fishbar, will be offering holiday diners a special a la carte menu of delicacies prepared by Executive Chef John Iatrellis on Christmas Eve; the restaurant will be closed on Christmas Day. Lure Fishbar is located in the historic St. Moritz Hotel building at the Loews Miami Beach Hotel at 1600 Collins Avenue. Valet parking is available. Reservations are required and can be made by calling (305) 695-4550. This season ‘The Avenue – British Diner’ is putting together Holiday Hampers that make unique and tasty gifts for friends, family, clients or co-workers. Each hamper includes scotch eggs, sausage rolls, chicken & ham pie and millionaire shortbreads… They will even deliver them for you. Visit http://bit.ly/avenueholidays to purchase yours. 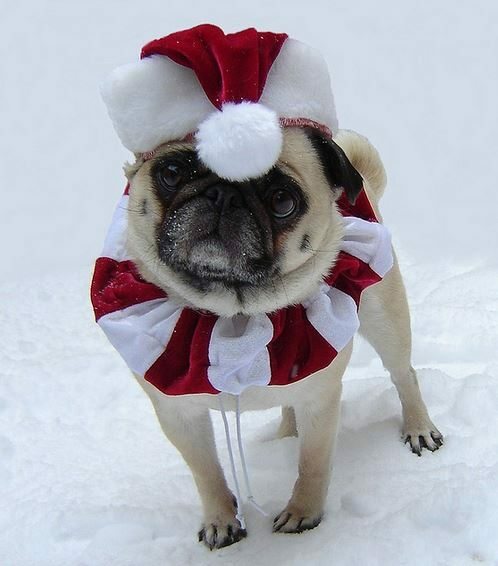 Use promo code ‘YESPUG’ for 15% OFF til December 20th. Spend less time in the kitchen and more time with loved ones this holiday – preorder Epicure Gourmet Market & Cafe’s homemade dinners, perfect for any seasonal occasion! potato and vegetable du jour, artisanal dinner rolls, cranberry sauce – topped off with Epicure’s signature, freshly-baked pies. Enjoy this seasonal ham dinner with potato and vegetable du jour, artisanal dinner rolls, homemade cranberry sauce – topped off with Epicure’s signature, freshly-baked pies. Upgrade your holiday dinner with either option paired with potato and vegetable du jour, artisanal dinner rolls, creamy horseradish sauce – topped off with Epicure’s signature, freshly-baked pies. Available through January 3, 2017. Please place your order 2 days in advance. Miami Beach: (305) 672-1861, Sunny Isles: (305) 947-4581. Staying in this season or attending a holiday party? 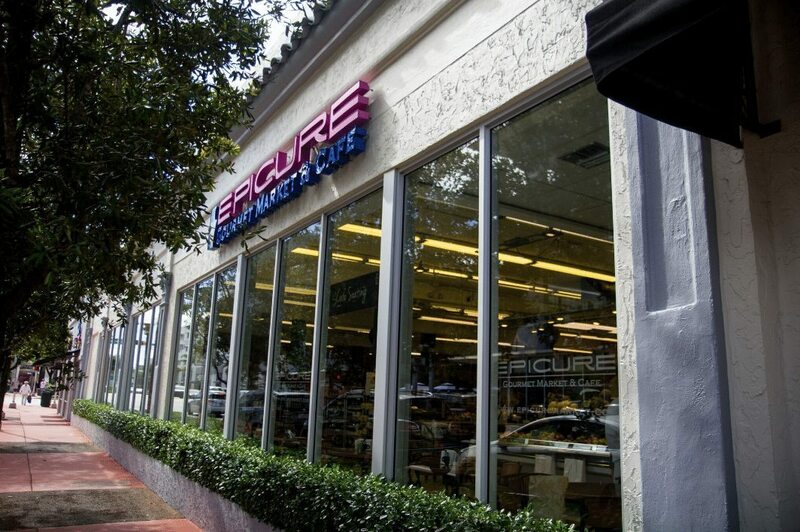 Find all of your party necessities at Epicure Gourmet Market. From premium champagne and caviar, to an award-winning bakery and lavish wine selection, Epicure has everything to help you ring in the New Year or celebrate any holiday. 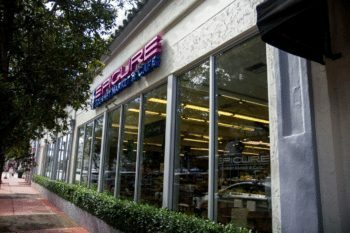 Whether you are hosting a party or kicking back in your PJs, Epicure is best one-stop-shop for season essentials. Chef/Owner Giorgio Rapicavoli, Owner/Operator Alex Casanova and the rest of the crew at the Coral Gables hotspot Eating House, host two special holiday meals to celebrate Christmas 2016: Taking place on Christmas Eve is Mañana Buena, a brunch highlighting typical Noche Buena flavors, and enticing tummies on Christmas Day, is Italian Christmas, an indulgent line-up of delicious homemade pastas for dinner. Noche Buena (literally translated to good night) is the traditional Spanish/Latin American Christmas Eve celebration in which family and friends gather to feast on roasted pig (lechon) and various sides. Channeling his Argentine roots and Miami upbringing, Rapicavoli created Mañana Buena (literally translated as good morning) to put a fun brunch twist on the widely-known custom. On Saturday, December 24, 2016, from 11 a.m. – 3 p.m., Eating House will offer their usual Wakin-N-Bacon brunch dishes, but will also be serving up their Mañana Buena brunch specials including, Porchetta Pan con Lechon, Vaca Frita Buns, Coquito Pancakes and $5.00 guava mimosas. On Christmas Day, Sunday, December 25, from 6 p.m. -10 p.m., Rapicavoli embraces his Italian roots with Italian Christmas – $16 plates of some of the chef’s favorite homemade Italian pastas and sauces that he used to help mom make weekly as a kid, including Pasta Carbonara, Pasta Pomodoro, Rigatoni Amatricana and Gnocchi a la Gorgonzola. 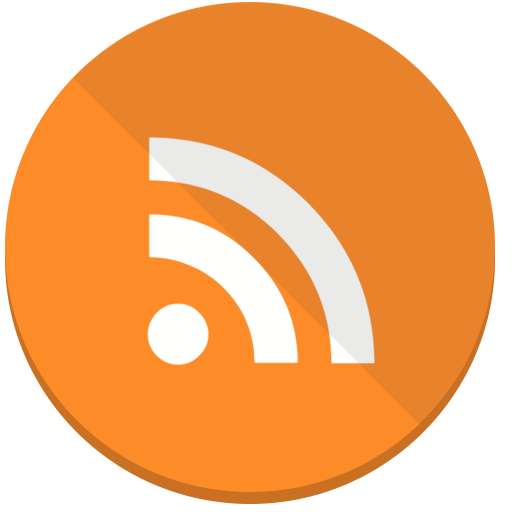 The restaurant’s regular al la carte menu will be also be on offer. Eating House, located at 804 Ponce de Leon Boulevard in Coral Gables, Florida, is open for lunch Monday- Friday, from 11-3 p.m.; dinner Tuesday through Thursday, from 6pm – 11pm; Friday and Saturday, from 6pm – midnight and for Sunday brunch from noon – 5 p.m. Telephone: 305.448.6524. Chef Richard Hales brings a family-style, Southern-Inspired meal to you this Christmas. 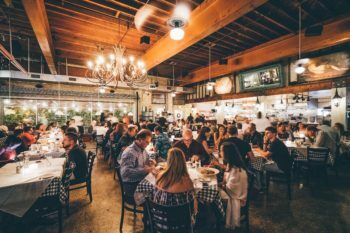 Menu highlights include 3 Jars–Avocado, Egg Salad and Whipped Ricotta–served with Heirloom Corn Chips, Dry Aged Roast Duck with Pepper Watermelon Jam, Sweet Potato Mash with Maple Bourbon Butter, and Fried Apple Hand Pies. Two person minimum; $65 per person. 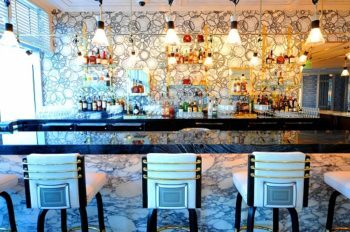 Burlock Coast Seafare & Spirits, Fort Lauderdale’s chic seaside escape, invites friends and families to celebrate the holidays with a special Christmas Day and New Year’s Eve buffet. On Christmas Day the regular breakfast menu is offered from 7AM to 11AM. From noon to 9PM, guests can choose from an array of decadent buffet options priced at $95 per adult and $49 per child (ages 5 through 12), excluding tax and gratuity. Offerings include a Breakfast Station (available until 3PM); Salad Station; Hammock Hallow Garden Bar; Charcuterie Display; Raw Bar; Sushi and Dim Sum Station; turkey and ham at the Carving Stations, and Hot Entrees such as Braised Lamb Shank with Cranberry Beans. Children can also enjoy their favorites such as macaroni and cheese or chicken fingers at the Kids Buffet. Guests can finish with a multitude of Christmas-inspired sweets at the Dessert station, featuring festive treats like White Chocolate Cinnamon Apple Lollipops and Mini Gingerbread Sandwiches. 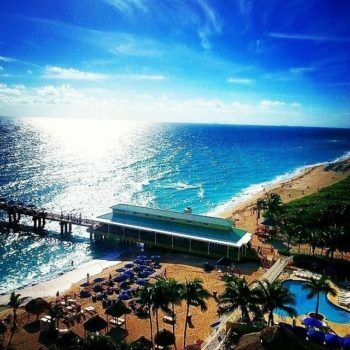 Burlock Coast is located at The Ritz-Carlton, Fort Lauderdale at 1 North Fort Lauderdale Beach Boulevard. For reservations, please call (954) 302-6460. 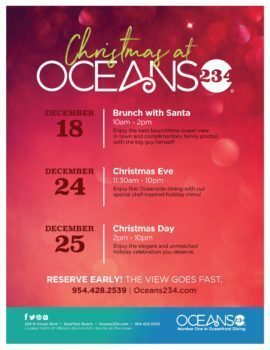 Oceans 234, Deerfield Beach’s premier seaside restaurant, is offering guests enticing holiday specials for an unmatched celebration. In addition to regular menu offerings on Christmas and New Year’s holiday specials include Jumbo Stone Claws (MP); Chilean Sea Bass, pan roasted with rock shrimp shiitake, bok choy stir fry, crisp lotus root and carrot ginger miso emulsion ($46); and Cowboy Rib Eye with root vegetable gratin, grilled broccolini and truffled porcini demi ($55). Be sure to bring the kids on Sunday, December 18th for Brunch with Santa from 10AM to 2PM, and enjoy the ocean view with complimentary family photos with the big guy himself! Holiday hours are as follows: Christmas Eve from 11:30AM to 10PM; Christmas Day from 2PM to 10PM; New Year’s Eve from 11:30AM to 2AM; New Year’s Day, brunch from 10AM to 3PM, dinner 3PM to 10PM. 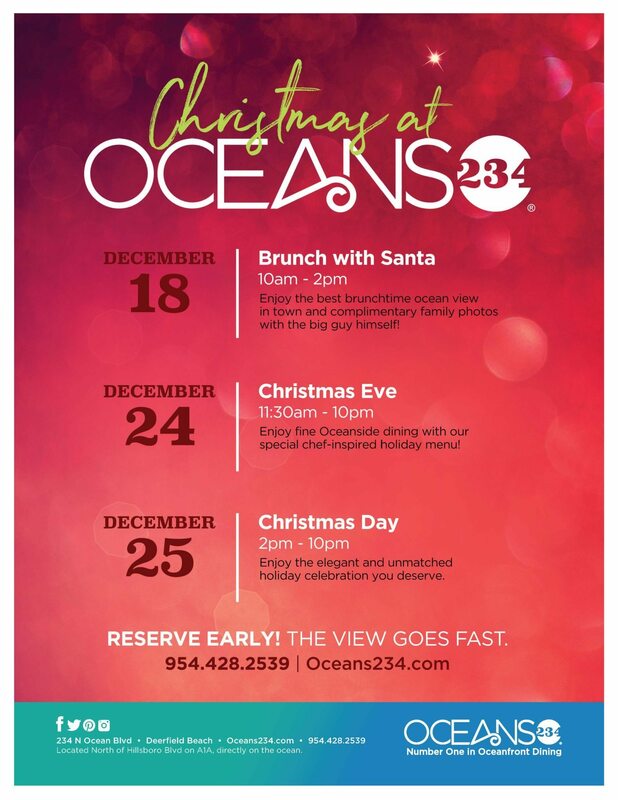 Oceans 234 is located at 234 North Oceans Boulevard in Deerfield Beach For reservations, please call (954) 428-2539. 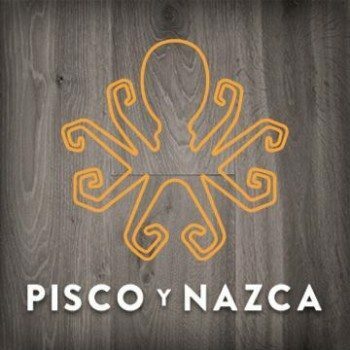 Head to Pisco y Nazca where the ceviche gastrobar is offering a special market menu for Christmas, available for dinner at both locations. Dishes include Ceviche Tropical, Arroz con Pollo and a special cocktail! Dishes are a la carte and range from $12-28. To make a reservation, guests can call ahead or book it through OpenTable. The market menu begins on December 13 for two weeks. Please note that the restaurant will not be open on Christmas Day. 3030 Ocean located inside the Harbor Beach Marriott Resort & Spa is offering diners a Christmas three-course prix fixe menu for $65 per person (excluding tax and gratuity). In addition to the regular a la carte menu, Executive Chef Adrienne Grenier will offer specials to include Chestnut Soup with duck confit; Slow Cooked Prime Rib with celery root, potato gratin, Swank Farm veggies, jus and horseradish cream; and White Chocolate & Quince Bread Pudding with egg nog ice cream. 3030 Ocean is located at the Fort Lauderdale Marriott Harbor Beach Resort & Spa, 3030 Holiday Drive. Dinner is served nightly beginning at 6PM. 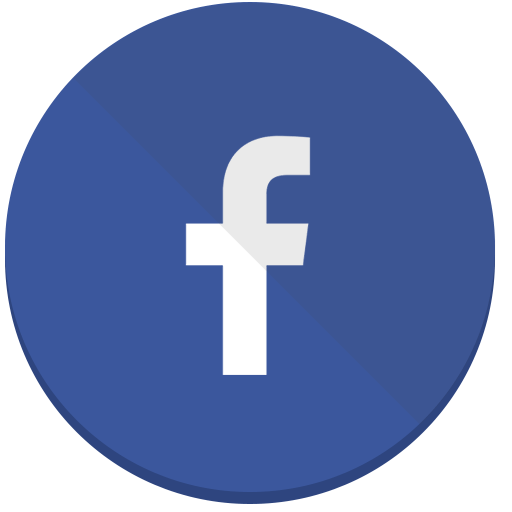 Telephone: (954) 765-3030. 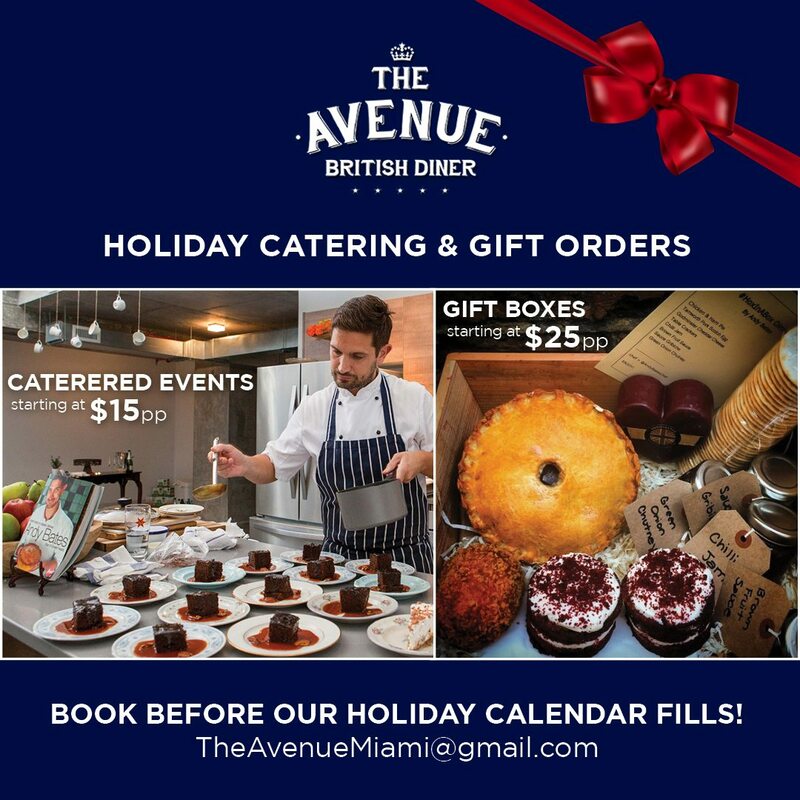 Winter in Miami Beach is hotter than ever for Christmas Day Dinner on Saturday, December 24, 2016 from 7PM – 2AM. Come home to Bagatelle Miami Beach to have a holly, jolly Christmas Eve. All you’ll want for Christmas is the savory dinner special, which includes Noisette De Chevreuil, Juniper Seared Venaison Loin, caramelized sweet potato, black trumpet mushrooms, turnips, and brussel sprouts with a red currant venaison jus. Vincent Daubas will have you rockin’ around the Christmas tree all night by spreading cheerful holiday jingles. 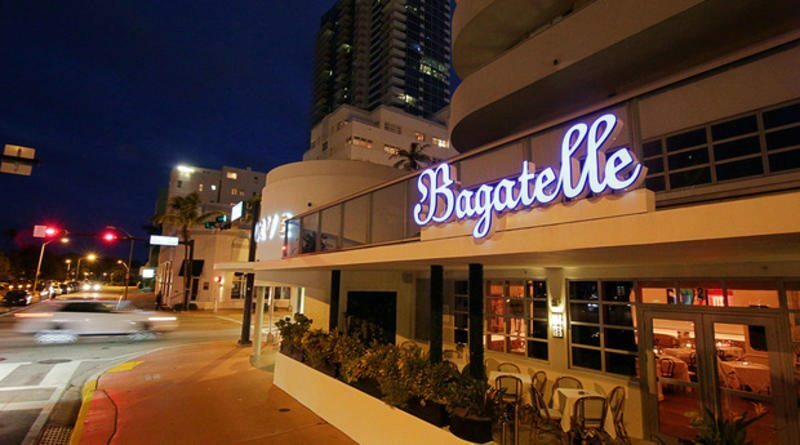 For reservations, contact miamireservations@bistrobagatelle.com or call 305-704-3900. Tis’ the season to be jolly—but most importantly, it’s the time to relish top epicurean experiences at Pao by Paul Qui on Saturday, December 24, from 6PM – 12PM the chefs at Pao kick-off the holiday with a Filipino-inspired Noche Buena. The four course, family-style menu evokes Chef Qui’s family recipes, with plates such as Potato Gnocchi with blood sausage and crispy pig ears, or Wild Mushroom Rice served with a choice of duck breast, short rib asado or the daily catch. 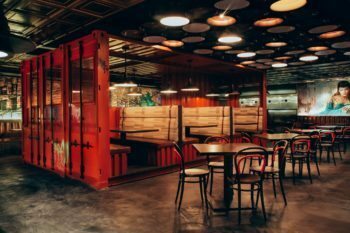 Francis Mallmann rolled up his sleeves and set the table for a taste of South American flavors at the Christmas Day Asado on December 25 from 6PM – 11PM. The menu offers dishes such as Lamb a la cruz using a traditional Argentinean preparation in which the meat is and slowly braised over wood then served with a pomegranate gremolata sauce and Salt-Crusted Salmon with basil and caper aioli. For further information, contact reservations at +1 786 655 5600. South Florida’s award-winning luxury resort is getting into the holiday spirit! 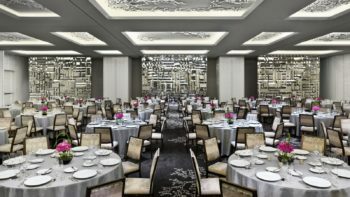 The St. Regis Bal Harbour is inviting guests to celebrate with their loved ones as they enjoy an exquisite Christmas Day Jazz Brunch from 10:30am – 3:30pm in the breathtaking Madeleine Astor Room which overlooks the Atlantic Ocean. Attendees will be serenaded by the resort’s in-house band, The St. Regis Jazz Trio. The resort’s new Executive Chef Franck Steigerwald has curated a decadent menu of holiday favorites, including salt-crusted salmon, prime rib, and honey roasted ham. No Christmas meal would be complete without dessert and Executive Pastry Chef Antonio Bachour and his team will dazzle and delight with an award-winning dessert display. 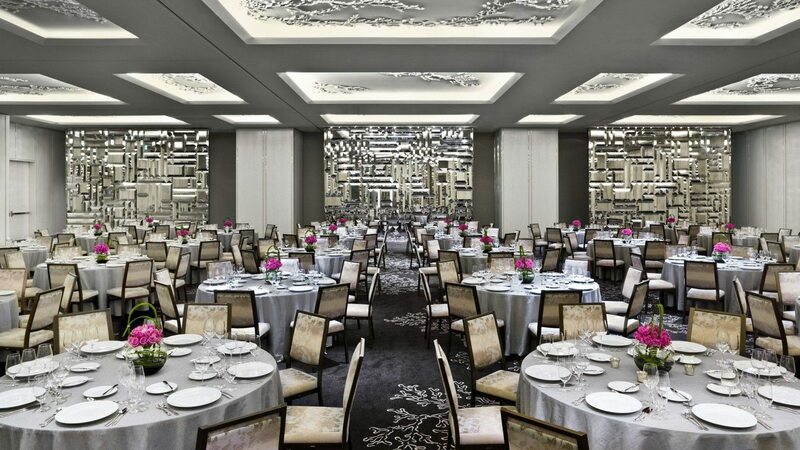 The St. Regis Bal Harbour’s Christmas Day Jazz Brunch is $150 for adults and $75 for children. Spacious and inviting, while still feeling cozy, locals have come to depend on Soyka for consistently delicious elevated comfort food. So, after seventeen years without Christmas service, Soyka has decided to open its doors and give guests the familiarity they long for this year. Dinner service will start at 5pm and be served until 11pm on Christmas Eve with regular menu items like the Soyka Classic Meatloaf served with sautéed green beans and house mashed potatoes with gravy, and one special holiday creation by renowned Chef Pedro Lopez. Brunch will be served on Christmas day from 11am until 4pm with the usual flowing mimosas and house favorites like the Wood Fired Brunch Pizza with house pomodoro, mozzarella, bacon, eggs sunnyside up, mushrooms, parmesan, and truffle oil. If that’s not tempting enough, live jazz musicians will join us for both Christmas Eve dinner and Christmas Day brunch, inciting nostalgia, and maybe even a sing-along, as they are sure to sing play a holiday tune or two. 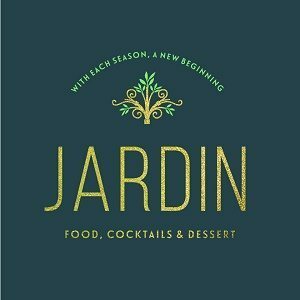 This Christmas Eve enjoy a delicious a la carte dinner from from rising culinary stars and husband-wife team Jordan Lerman and Stephanie Cohen at Jardin. The duo offers ferociously seasonal modern American cuisine and craft cocktails. Everything at Jardin is made in-house — from breads, chips and charcuterie to jams, pasta, and ice cream. Focusing on seasonality, the menu changes almost weekly with creative dishes that are a feast for the eye and the palate. Menu highlights include:Roasted Winter Salad, beets, Jerusalem artichoke, fall vegetables, pumpernickel, grains, house ricotta ($12), Braised Beef Ribs, cider glazed cabbage, cheddar polenta, pan roasted apples, hazelnut gremolata ($28),Oven Roasted Chicken, herb brioche stuffing, white onion, berries, hen of the woods mushrooms, confit marble potatoes ($25). Chef Lerman shines in the kitchen with his inventive cuisine, but Chef Cohen’s dessert offerings are reason alone to visit the restaurant. 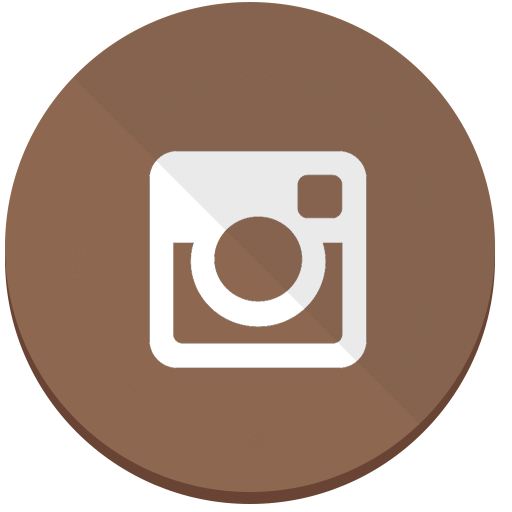 Rotating seasonally, current standouts include the Can I Have S’more’?, a playful take on s’mores with warm chocolate & eggnog, graham, chocolate, and house cinnamon ‘mallow ($10), and the Mmm….Doughnuts with blackberry jam, maple and brie custard ($8). 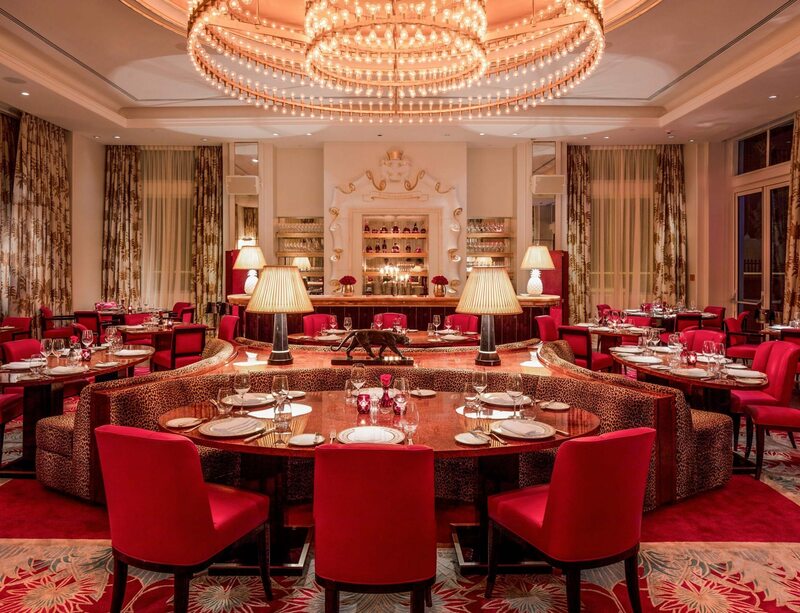 For a full exploration of the menu, guests can indulge in Jardin’s ever-changing 6-course Chefs’ Tasting. For reservations, please call 561.440.5273. Offered on the 24th and 25th of December, Seaspice’s Christmas menu will feature dishes like Chestnut Soup, Fire Roasted Porchetta, Pan Seared Turbot Fillet and Pistachio Cake, all day throughout normal hours of operation. 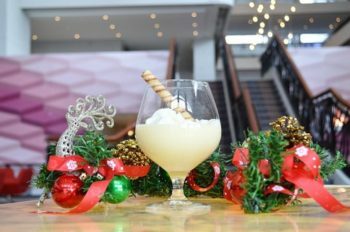 Upon arrival, guests will be welcomed with a delicious coquito drink. On December 24, Christmas Eve dinner is served from 6:30 – 11:30 p.m.
On December 25, Christmas Day lunch will be served from noon to 6:00 p.m. and dinner from 6:30 p.m. to 11:30 p.m.